A luxury Hermes handbag fetched a jaw-dropping $380,000, shattering the world auction record in Hong Kong on Wednesday, Christie's said. The auction house didn't identify the buyer of the matte white "Himalaya" crocodile skin Hermes Birkin bag. The handbag was produced in 2014 and has 18 karat gold buckles and strap loops encrusted with 205 diamonds. 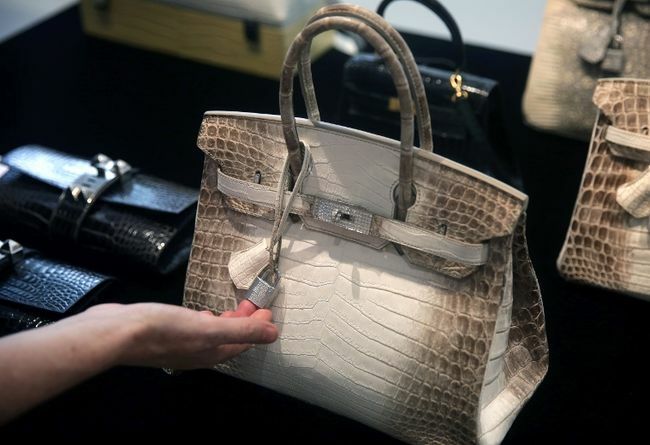 It fetched 2.94 million Hong Kong dollars ($380,000), which Christie's says is a record for any handbag sold at auction. The price flew past the presale estimate of HK 1.5 million-2 million ($193,000-$258,000) during 10 to 15 minutes of intense bidding in the auction room and from phone and online buyers, Christie's spokeswoman Gigi Ho said. The price surpasses the record set a year ago when Christie's auctioned a similar Birkin bag for $300,000. It had identical specifications but was produced in 2008.